The problem with hand-written signs is that there’s no spell-check to fall back on. This sign in a local Loblaws, which combined two errors in one word, was the very first thing customers would see upon entering the store a couple of weeks ago. Spelling flames aside, it created the impression that the people there just don’t care: whoever wrote the sign couldn’t be bothered to check the spelling of a common word and either no one else noticed or they didn’t say anything. It certainly makes me even warier than usual when it comes to trusting that the food isn’t mouldy or short-dated. 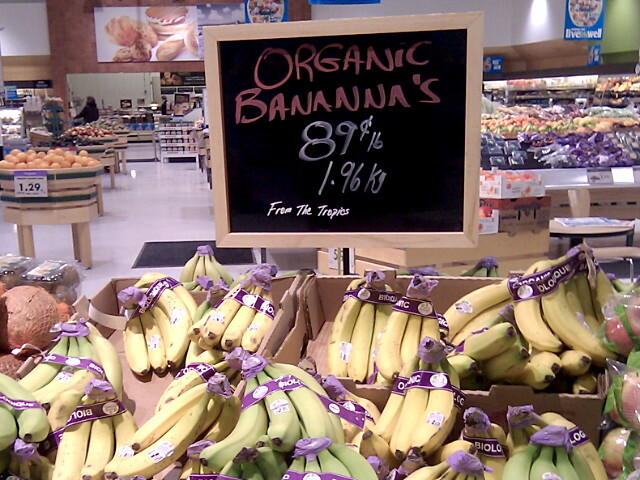 I like that they added “from the tropics”, because that’s so helpful for shoppers who are concerned about the country-of-origin, and it also makes clear to everyone that these are not Ontario-grown bananas/bananna’s.